So, there you are, trying to find that magazine or small piece of paper with that important number. Searching for anything on your desk, seems like a treasure hunt! Where did your desktop go?! 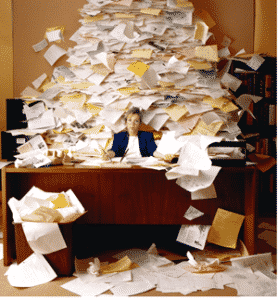 Here are a few ideas to help you get that paper clutter under control. I know that i have mentioned this in earlier posts, but I cannot emphasize how much this helps not only your finances, but your clutter. By keeping all of your budget and financial papers in this one location, you’ll no longer be in the day of being so flustered because you know that one bill needs to be paid, and you can’t locate it. Plus, who doesn’t love having a clutter free desktop? You have that notorious stack of magazines that are piled so high, that they are about ready to topple over. Is there really a reason you are keeping ALL of them? Maybe there’s a great article that you’ve been meaning to read, or possibly a recipe you know the family would enjoy. Do you really need to keep the whole magazine? Here’s what I like to do. I have made a binder that’s labeled “Magazines”. I carefully tear out the articles and recipes from the magazines, use a hole punch and put them in the binder. I have dividers for each of these sections: “Health and beauty”, “Recipes”, “Household Tips”, “Crafts” and “Decor”. This lets me recycle the rest of the magazine and clear off my desk and keeps everything in a nice easy to find “Book”. It takes 30 (Sometimes less) seconds to go through the mail as soon as you bring it in. Sort out the mail IMMEDIATELY! File things that you plan to keep, and toss the junk mail! It will make a huge difference! This has helped immensely! I have a slotted desktop file holder, with three folders in it. They are labeled as follows: “To File”, “To Mail”, and “Something’s Missing”. The “To file” is anything that still need to have holes punch, and be put in my budget binder, or things that go in our tax file. Basically, anything that “needs” to be filed. The “To mail” will hold the bills/birthday and anniversary cards/letters, that need to be mailed. The “Something’s missing” folder hold things that need a stamp, address, check, or anything else that has something making it not ready to be mailed. I apply this to almost all aspects of my life. When I’m finished at my desk, I take a few minutes to put things away (Where they belong) and straighten up. This usually just takes a minute or two, but I like to give myself 5 minutes to be safe.